The Murray 24 Inch Dual Stage Snow Blower is one of the smaller models of snowblower produced by Murray. They have a lot of machines like the Murray 27 Inch Dual Stage Snow Blower and the Murray 33 Inch Dual Stage Snow Blower that are much bigger than it, while the Murray 21 Inch Single Stage Snow Blower is smaller that it. 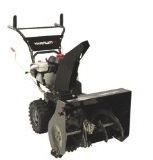 This 24 inch 2 stage snow thrower is powered by a 0.21 liter Briggs and Stratton 800 Snow Series engine. This engine gives the snow blower 8 ft-lbs of torque. The fuel tank feeding this engine is capable of holding 2.74 liters of gasoline. This snow blower has 6 speeds going forward and 2 in reverse thanks to it’s friction disc gear box. The auger on the Murray 24 inch dual stage snow blower has a diameter of 0.3 m (12 inches) and is made from very strong serrated steel that will happily break up even the most compacted snow and ice. Once it does, the snow and ice fragments are shipped towards the center of the clearing area where the 0.3 m (12 inches) diameter impeller further breaks the snow and ice up and sends it’s flying up to 11.6 m (38 feet) from the clearing area. The impeller consists of of 3 steel blades. The chute on the Murray 24″ two stage snow thrower is made from plastic. It can rotate up to 190 degrees and is rotated using a crank. The snow thrower gets it’s traction from X Trac tires that offer fantastic grip to the snowblower even when it’s traveling over uneven and/or icy surfaces. The housing of this snowblower rests on adjustable skid shoes that allow the operator to control how high the auger is positioned above the ground. The length of the snowblower comes in at 1.14 m (45 inches) while it has a height from ground level of 0.77 m (30.5 inches). Interestingly the total width of the snow thrower measures is 0.74 m (29 inches), that’s 5 inches wider than it’s clearing width. Click Here to buy the Murray 24 Inch Snowblower.